I have three new ladies in my life – aren’t I a lucky boy? They are, of course, not human instead are, actually, Guinea Pigs with capital G and Ps. Going along with the Greek theme (see Rabbit named ‘Delphi’ below) the girls are called Hera, Hebe and Attica. Attica is mine. She looks like a very suave skunk, but is a bit nervy. She’s going to be the hottest Guinea Pig on the planet when she grows up. Hebe, however, might be blind/mad or both. I see a hollywood romcom coming up with two sisters at the opposite ends of the spectrum, getting together to thwart a man/each other or both. I’ll never let it happen, i promise. This week’s story is a bit clunckily written, but has some nice sci-fi style ideas. It sounds like the summing up of a novel and maybe one day it will be. 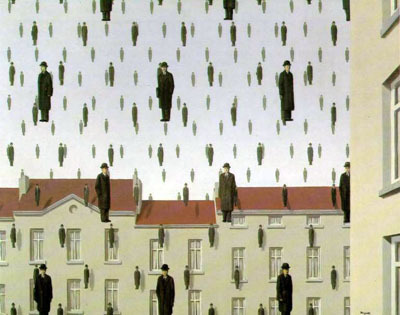 The subject of this week’s story is the surreal artist Rene Magritte, who I have taken a sudden interest in. You might know his paintings like this one, this one and this one and I am quickly becoming quite a fan. 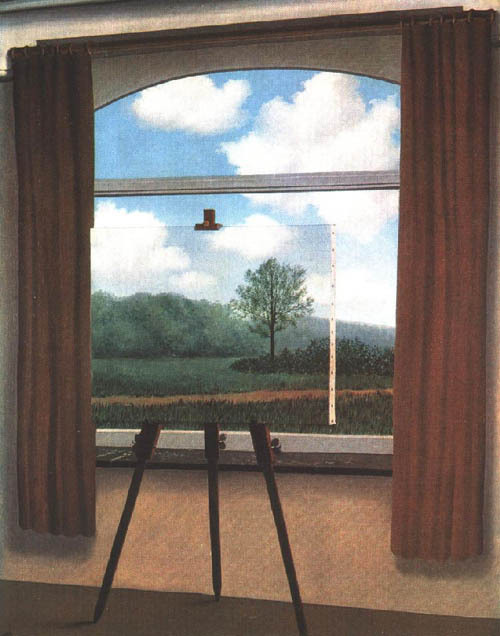 I like the simplicity and the mystery of his quirky paintings that seem to have no deep pretensions and exist on a quite seperate plain from the other surrealists. By all accounts he was a quiet, reserved, fame-shy sort of guy who let his paintings speak for themselves and i think that’s a very respectable quality, epsecially in this day and age. As a reference, this story concerns this painting, this one and this one and other ones in a vague sort of way. Make sure you check out the new additions to my blogroll. Bye bye for now! A lovely love story this week, because Valentine’s Day is just around the corner and little personal celebration of 3 years with Hannah as of the 1st of Feb. But this aint no ordinary love story. no this is love between an illiterate tramp and a statue. it might also be a true story.